One of the most frustrating parts about organizing is that when we get a burst of organizational energy, we want to take care of everything in one day. And then, when we realize that organizing everything in one day is impossible, we get frustrated and nothing gets done. For this reason, I am challenging myself (and you!) to get more organized with a realistic goal. Join with me each week for the next 6 weeks to tackle a new space in your house. Do remember the Friends episode where Monica's junk closet is revealed, she's super embarrassed about it, and the rest of the gang love it because she's such a neat freak? These drawers are side by side in my kitchen. EVERYTHING gets dumped in here. Something had to be done about this disaster. So I threw everything away I didn't need. And was left with only this. 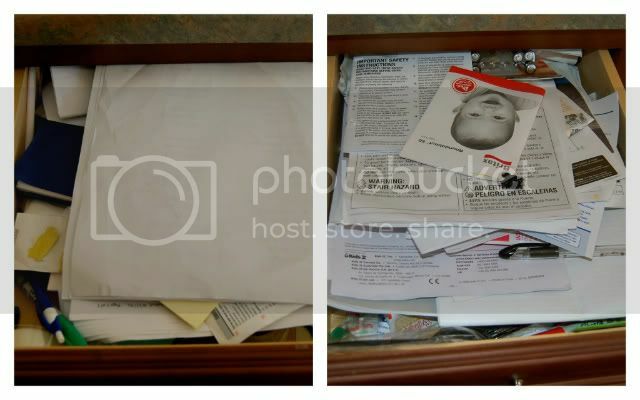 Then, I got some $3 organizing containers from WalMart. And in just a few minutes, everything was organized. Humongous change in a short amount of time. I hope you take on the challenge as well! 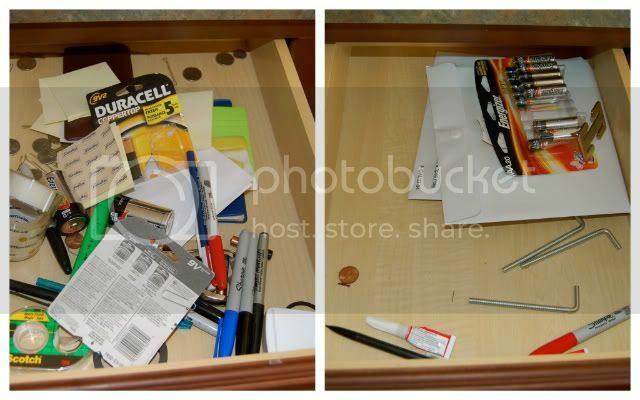 I would love to see and/or hear about your junk drawer transformation. I did this a few weeks ago! I'm about to move, and I definitely want to organize my drawers in the process! Perfect opportunity! Drawers are the hardest! 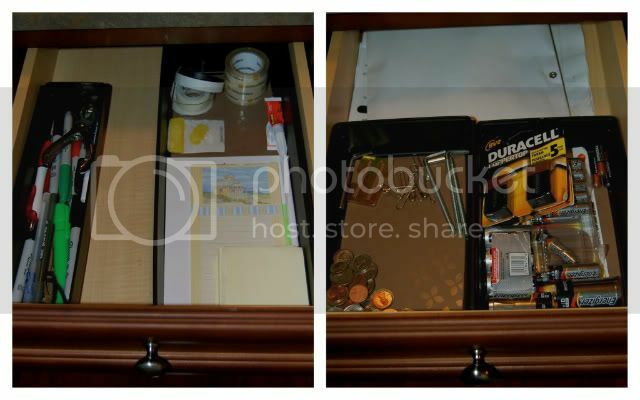 Isn't it amazing how a couple containers can get and keep you organized? Just wish I could find some containers big enough to get my garage in order! @Leigh, good luck with the move! Drawers are SO hard to keep clean. @Karen, Our garage is super teeny so we barely keep anything in there...but have you seen this?